WATER minister Charity Ngilu has said that she will not greet Vice President Kalonzo Musyoka because he is not a good man. Ngilu said she does not have a duty to greet the VP and that she owes no one neither apology nor an explanation as to why she has chosen to snub Musyoka. Although Ngilu did not explain how the VP is a bad man, it is believed that the two fell apart from good in the light of recent corruption investigations in Ngilu’s ministry and which she strongly believed were instigated by the VP. She told the Star that if she was bad, she too would not be deserving of the VP’s greetings. “I was not elected by the people of Kitui Central to be greeting the Vice President. I was elected by the people of Kitui to serve them and I am doing this to the best of my capacity,” she said. In the recent snub at Itoleka market in Kitui Central, Makadara MP Gideon Sonko Mbuvi instigated a forced public reconciliation of the two which backfired and ended up embarrassing the VP. When “Sonko” invited the VP to the podium where Ngilu was, the water minister protested and urged the VP to stay put. The VP nevertheless rose up and walked to the podium extending his hand to Ngilu who frowned at it. Embarrassed, the VP is shown in TV clips grabbing the hand of water minister and attempting to greet her. “I am not under any obligation to greet the VP, no, not at all,” Ngilu said on phone. Yesterday, Ngilu was quoted as saying that the VP has been undermining her over her role in distributing water in Ukambani’. The two are the senior most leaders in Ukambani with Musyoki having been in parliament since 1985, serving in several powerful ministerial dockets, as deputy speaker and now as the vice president. Ngilu on her part has been in parliament since 1992, vied for presidency in 1997 and served as cabinet minister in health and water dockets. The two have never been in the same party although they have since 2002 found themselves on the same side. Between 1992 and 2002, Ngilu was in DP and SDP while Musyoka was in Kanu all through. In 2002, they both found themselves in Narc and in cabinet as well. In 2007 again, they went separate ways but found themselves in same post election cabinet. 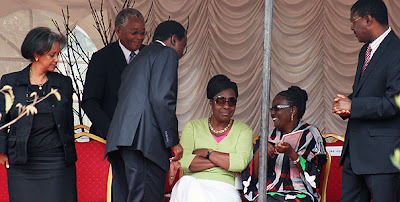 Politically, Musyoka is Ngilu’s senior although this is quite tricky in the coalition setting.